UGallery is proud to collaborate with popular social media movement Everyday Africa on a unique photography collection. 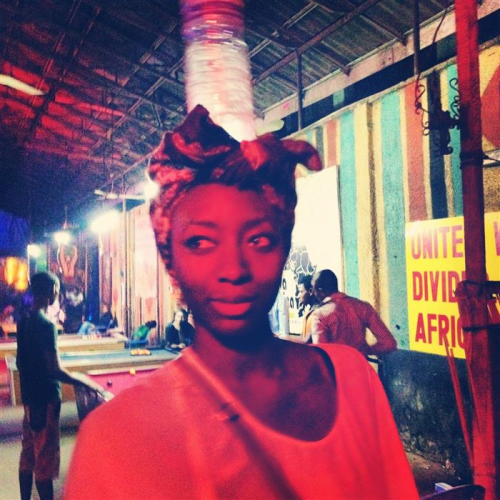 Founded in 2012, Everyday Africa is a nonprofit network of photojournalists and native self-taught photographers. Their images strive to rise above media-driven stereotypes – depicting the continent as a place overrun by nothing but poverty, disease, and war – to show that the extreme is not nearly as prevalent as the familiar, the everyday. Having amassed 2,600 images and 283,000 followers on Instagram, the Everyday Africa images featured here come from 18 photographers, spanning 15 countries. The project has inspired dozens of “Everyday” feeds around the world, which have come together to form The Everyday Projects—a nonprofit organization promoting local norms and global commonalities. All net proceeds from this sale will fund further educational initiatives and a forthcoming book. Everyday Africa thanks you for your support! You can preview a selection of photographs below and browse the full collection on UGallery. Afro on purple. Silhouette of the photographer’s daughter. Accra, Ghana. Photo by Nana Kofi Acquah (@africashowboy) for Everyday Africa. 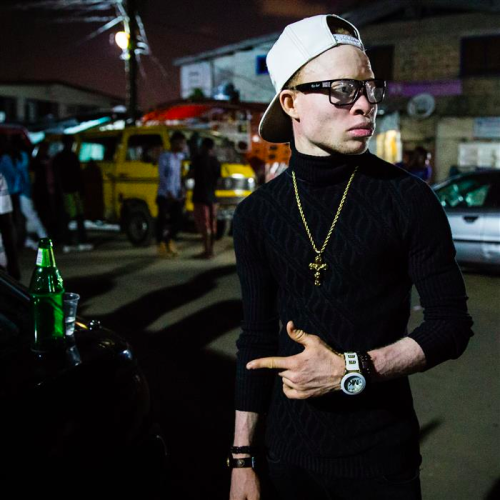 Omotore is a 21 year old albino Afro hip hop artist in Lagos, Nigeria. He is using his music to voice some of the stereotypical issues his fellow albinos face. He is constantly been discouraged by even show promoters that he will never make it as an Albino, but Omotore is not giving up. He strongly believes there is hope for him to become successful as an albino. No doubt Salif Keita, the famous Malian musician, is one of them. Photo by Tom Saater (@tomsaater) for Everyday Africa. 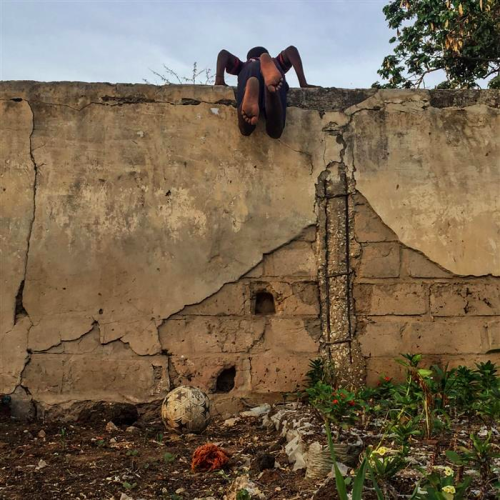 A young boy climbs a wall in Dakar, Senegal. Photo by Ricci Shryock (@ricci_s) for Everyday Africa. 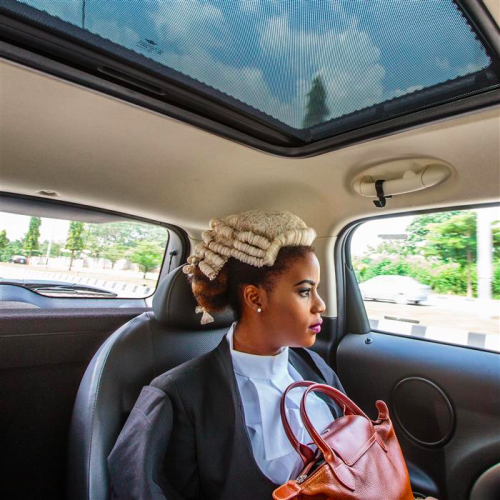 Ginika, one of thousands of Nigerian law graduates called to bar, on her way to the big ceremony in Abuja, Nigeria. Photo by Tom Saater (@tomsaater) for Everyday Africa. 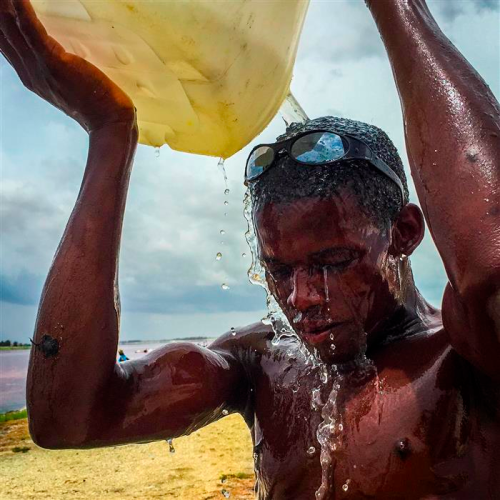 Cooling off during a break at the salt mines of Le Lac Rose, Senegal. Photo by Jane Hahn (@janehahn) for Everyday Africa. 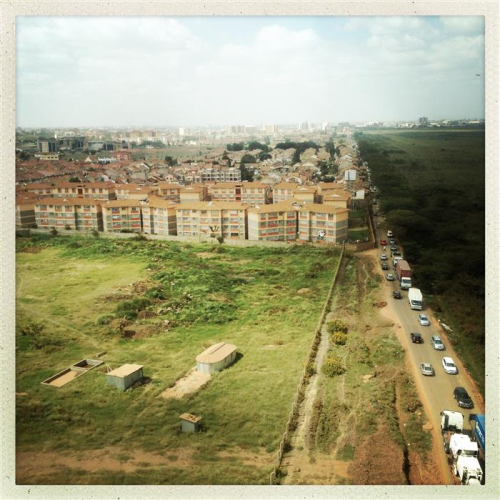 The divide you get in Nairobi between development on the left and the Nairobi national park and its wildlife and wilderness on the right. “We are made to believe in our society that development and everything that comes with it will make us happier – I have serious doubts about it!” Nairobi, Kenya, August 2015. Photo by Guillaume Bonn (@guillaumebonn) for Everyday Africa. 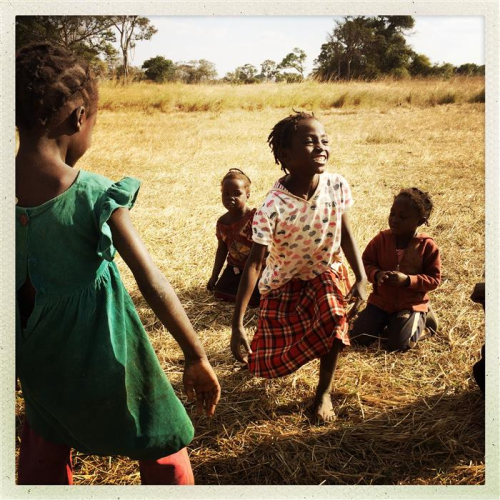 Girls play an afternoon game/dance-off in rural Zambia in a village an hour outside Kabwe. Many of the families around here are subsistent farmers who grow tomatoes, cabbage, kale and other food. July 2015. Photo by Idil Ibrahim (@i_am_idil) for Everyday Africa. 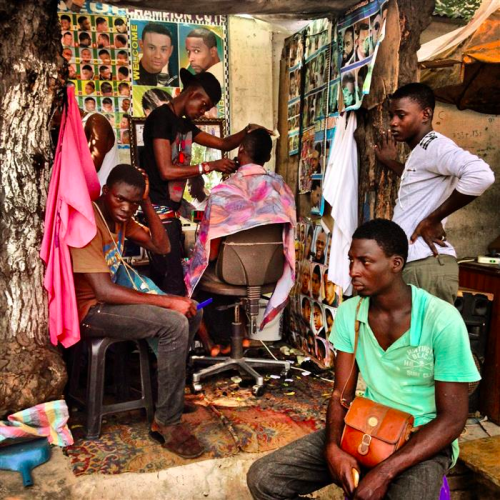 The barbershop on Tudu street, where traders, hawkers, and people who hang around Tudu Market pop in for a quick haircut. Accra, Ghana. Photo by Nana Kofi Acquah (@africashowboy) for Everyday Africa. Zainab poses for a portrait at the Shrine, a nightclub on the outskirts of Lagos, Nigeria, on September 30, 2012. Photo by Glenna Gordon (@glennagordon) for Everyday Africa. 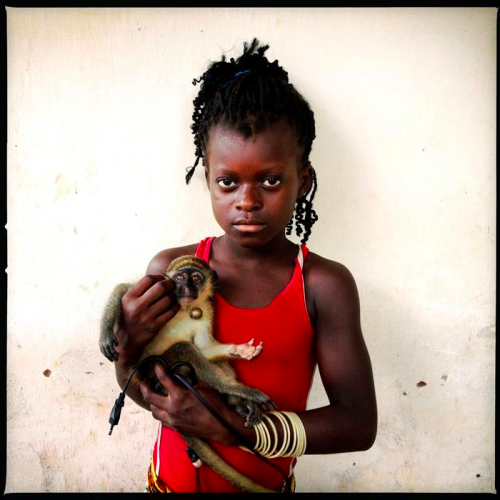 Mariama, 10, and her pet monkey, with a re-purposed electrical cord for a leash, in Bolama, Guinea-Bissau, November 11, 2012. Photo by Holly Pickett (@hollypickettpix) for Everyday Africa. 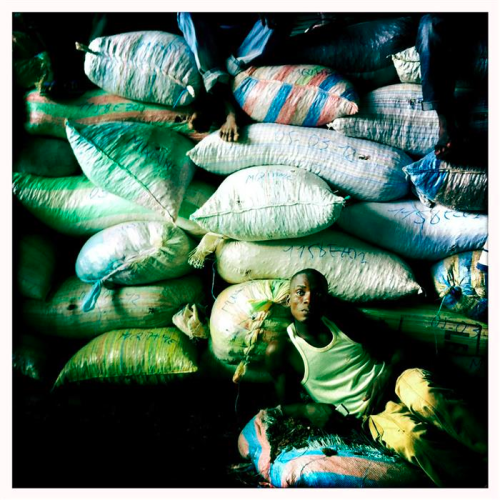 A worker rests amidst sacks of cocoa at Saf Cacao, the largest nationally owned cocoa exporter in Ivory Coast, in San Pedro, Ivory Coast. Photo by Peter DiCampo (@peterdicampo) for Everyday Africa. 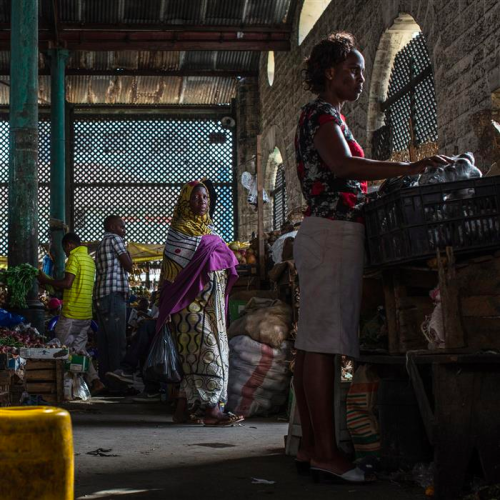 MOMBASA, Kenya: Mombasa’s spice market sprawls across several city blocks, the traders reclining amid their wares of spices, figs and fruit. Photo by Nichole Sobecki (@nicholesobecki) for Everyday Africa. See the entire Everyday Africa collection on UGallery.